Why do developers continue including ice levels? Hey, it’s the Ominous Voice here. Been sitting around, snacking on Mr. Noodles dry like those kids in the 90s used to do on the playgrounds. You know, before their hearts failed and they dropped like preserved flies? I’ve been thinking about video games and feeling a bit down. Must be that Seasonal Affective Disorder. The world’s getting colder; obviously global warming is failing because I want to be able to wear my Bermuda shorts down the street in late October. Err…if I could wear shorts…but I can’t…because I don’t quite have the legs for it…or legs at all… Boy, I don’t have much to be thankful for at the moment! It’s way too cold outside now. And that reminds me of one thing I’m definitely not thankful for: ice levels! 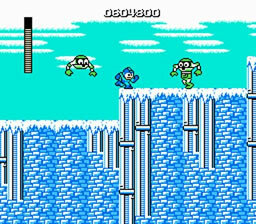 I don’t know who decided that this should become video game law, but ice levels seem to be everywhere! And nobody likes these! Slipping and sliding on an icy platform does NOT make things more exhilarating. It just makes your character harder to control and more likely to slide straight into a ravine or a chilly puma’s mouth or something. If the controls of a game already stink, this just adds vinegar to the burned area. And I only put vinegar in my coffee, not my pseudo-flesh wounds! The weird thing is that sometimes the snow is just arbitrary: you step just a little bit to the east, and suddenly there’s a an entirely frozen area. Take Donkey Kong Country, for example. Why is there a whole freakin’ ice cave world in there? Isn’t Donkey Kong Country set in the tropics? Same thing goes for Donkey Kong Country 3; only a wedge of the region is covered by snow. Now here’s something I don’t understand. In the upcoming Donkey Kong Country: Tropical Freeze for Wii U, the island is being FROZEN, thereby giving a reason why there is snow. 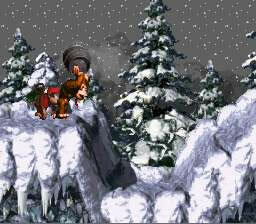 In Donkey Kong Country Returns, there was no snow. Therefore, the only reason why an ice level would exist there is because of some weird magical spell! Donkey Kong 64 also did not have any cold-based worlds. No icy peaks should be found on DK Isle! Bah! Sometimes they just stick these specialty levels in because developers think they have to. Super Mario 64? Cool, Cool Mountain and Snowman’s Land. Banjo-Kazooie? Freezeezy Peak. Ocarina of Time? An ice cavern (called the “Ice Cavern”, because they were too busy NOT programming Link’s pants to think of a creative name). Majora’s Mask actually had a snow dungeon, too. The Wind Waker has a snowy island. Twilight Princess has Snowpeak. Come to think of it, I’ll bet the entire Zelda outlands are just tundra. No wonder you don’t see anyone living out there: it’s not fun! Now I can cut a few games so slack. Super Mario Bros. 2, for example, has a frigid climate in World 4. It doesn’t exactly make sense why it’s there unless you consider that the whole game was Mario’s dream. Or at least I’d LIKE to believe that if Birdo and a bandwagon of useless Shyguys didn’t suddenly pop up everywhere! Kirby 64 also gets a pass because Kirby literally flew to a different planet, er, star, er, whatever, and that’s acceptable. In other words, provided you have a legitimate reason for boasting an ice level (such as everything being just a hallucinogenic dream like Mario had or clearly indicating that the main character is taking a significant journey away from the rest of the terrain), then I will accept, even if it’s not fun. And then we get to the Mega Man series. Those games don’t simply contain the occasional blizzard stage; they contain EVERY kind of stage you could possibly imagine. Ice, fire, wind, water, electricity, uh…garbage compactor…construction site…creepy circus… You name it, they have it. No one at Capcom has ever really explained WHERE exactly they are. How is Wily able to rent out all this space? And it’s not like a small corner bodega’s space; we’re talking serious acreage! No wonder we’re suffering from food shortages in some countries: Dr. Wily’s probably buying up all the good farmland and putting Top Man in charge! This is also why we don’t have curling games, either. Bah! I gotta go get a sweater and then figure out how to put it on a metaphysical body. Ice stages are awesome. Music is usually some of the most atmospheric in the game, ice and snow typically look really pretty, and the changes in game physics / visibility challenge the player to adapt to new situations, which keeps the gameplay from becoming stale. Besides, if you just jump constantly, you hardly slide at all. Also, several of the Mega Man games explicitly state where the stages are, or at least give a broad idea: “Frozen Island” is where Blizzard Man can be found in MM6; Frost Man is up on the border of Alaska and Canada according to the map in MM8; the X, Zero, and ZX series all give descriptions of what each boss’s area is, and the Battle Network games all take place in cyberspace, where anything can happen. I hated ice levels. They totally seemed obligatory. It's not exactly a survival horror game, but it's also not an adventure title.